Promote a healthier lifestyle. Great for Walk-a-Thons, Healthcare and Educational events. 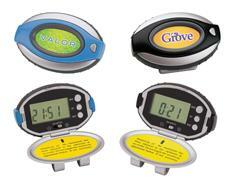 Our Deluxe Pedometer is available in two color chioces. It features a timer, clock, distance, sensitivity setting and a belt clip. Human Resource Managers and Event Planners know this is a winner!